This is a nice Renaissance silver finger ring, dating to the 16th - 17th century A.D.The ring has a large decorated bezel, engraved with the Christogram "IHS". The bezel is finely engraved, so too are the shoulders. The IHS Christogram is interpreted as meaning Iesus Hominum Salvator ("Jesus, Saviour of men" in Latin) or connected with In Hoc Signo. Such interpretations are known as backronyms. Used in Latin since the seventh century, the first use of IHS in an English document dates from the fourteenth century. The most famous use of this Christogram is on the seal of the order of Jesuits, who worked for the Vatican. Jesuits were especially involved in the counter-Reformation, having agents in England working directly on the orders of the Pope. 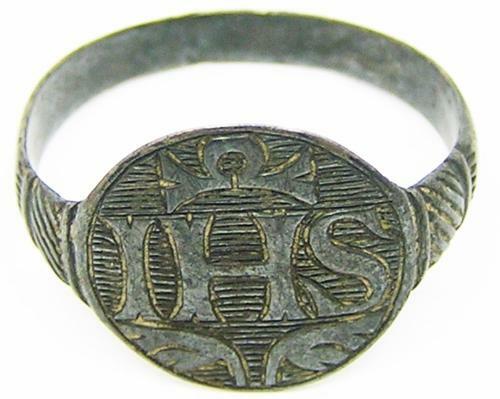 Such a ring may have been worn by a Jesuit spy, but in reality, being caught with this emblem would have been a certain giveaway of their Catholic faith. Thus it is most likely a silver ring belonging to a Catholic priest, as a symbol of his devotion and love of his Saviour Jesus Christ. This ring has survived in excellent condition, with no damage or restorations. It retains a fine tone and earthy deposits from the excavation. Today this ring is perfectly wearable with care.